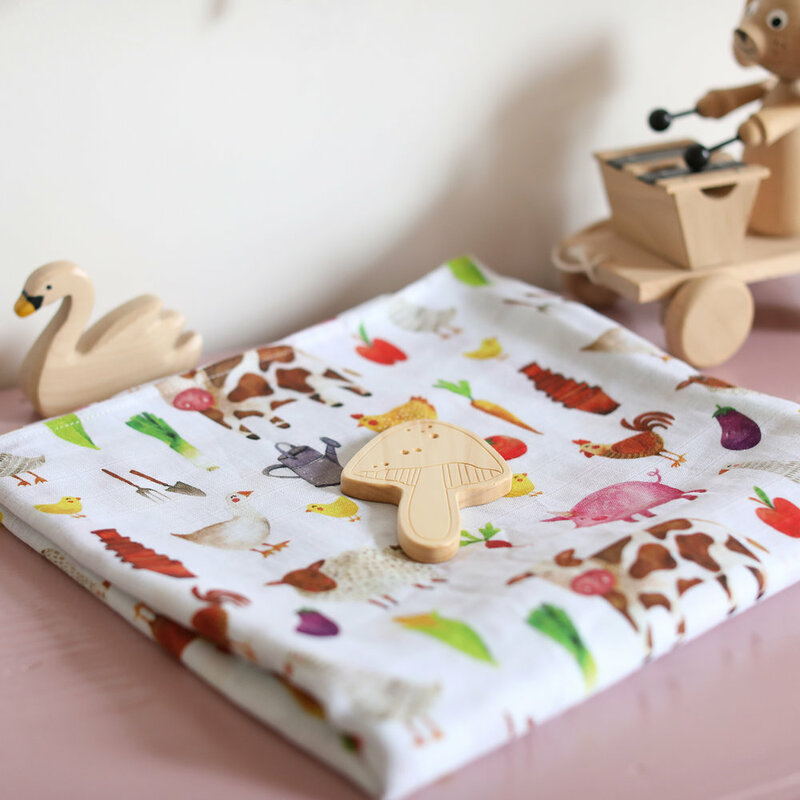 Three new swaddles are coming soon! 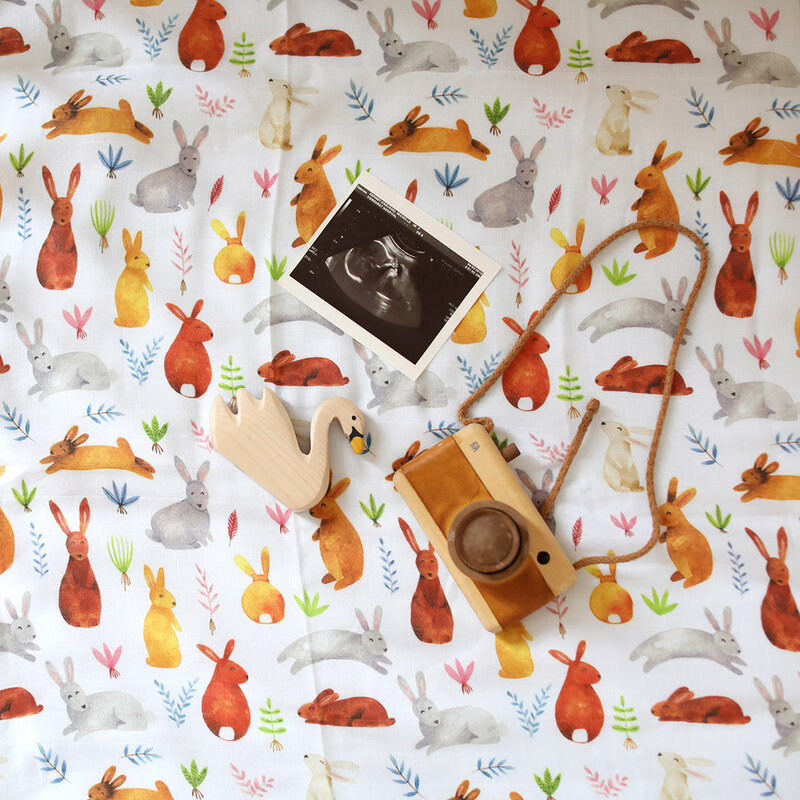 The Woodland and Happy Clouds will be back in stock too. Please follow me on Instagram, here for updates and special discounts. 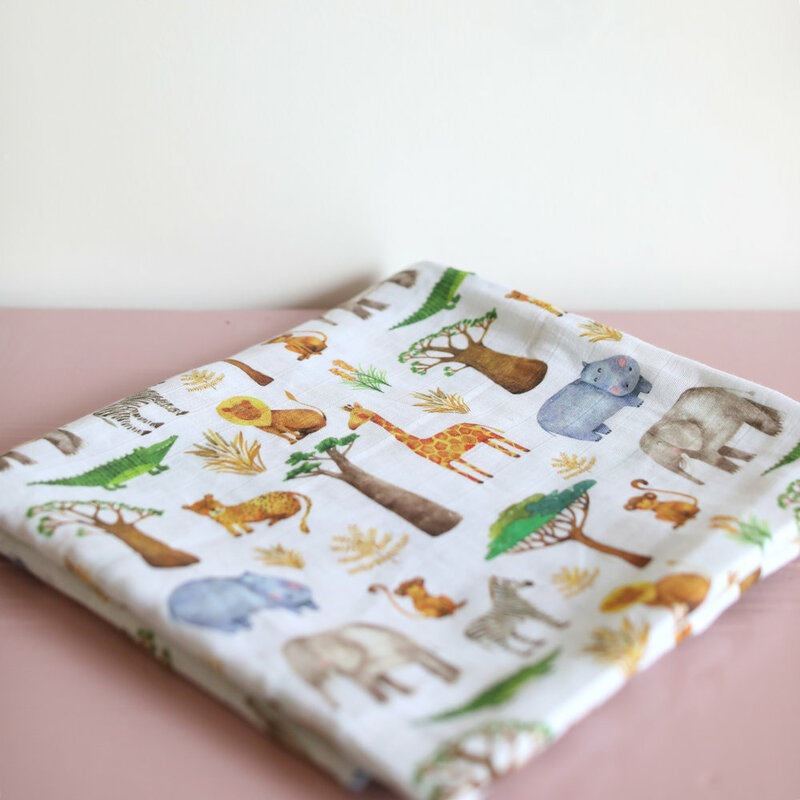 These swaddles will all be available to pre-order for a discounted price. 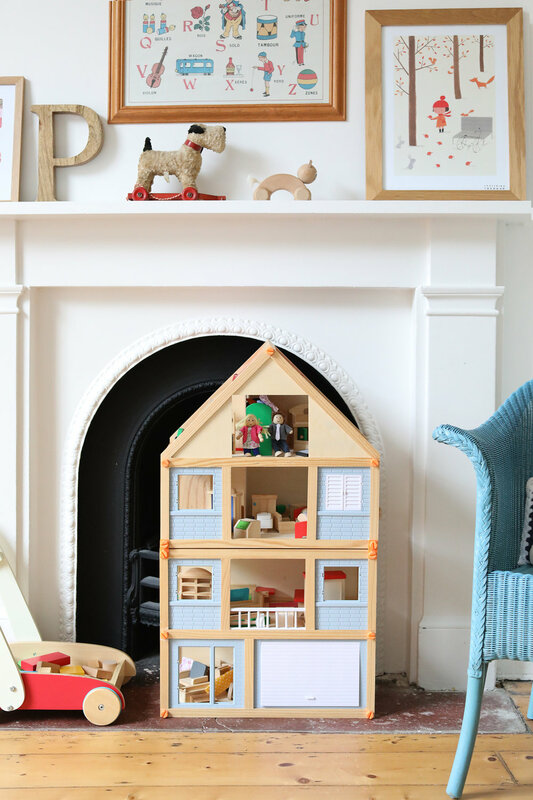 I am finally posting about the updated Nursery. We should really start calling it the kids room, but it seems nursery has stuck. Beatrix is not in here yet, she is still in a separate room, but I am planning on moving her in soon. The cot will have to find a place and I will have to rearrange again, but we are definitely getting there! There are a few things that still need doing, especially hanging pictures, but in general I’m happy. I moved the bed around so many times and it took ages to find the right layout. I wanted space in the middle for them to play, but also wanted Penelope to have a nice view when laying in bed. ‘Penelope’ Alphabet Picture by Viktorija from Andsmile Studio. Cat illustration from Faye Moorehouse. My mum made the crochet snake for Penelope before she was born. The bear cushion is a design I did for a Handmade Baby Book. The two beautiful cushions in the back were gifted to Penelope and Beatrix by their great aunt. Handmade in Canada. 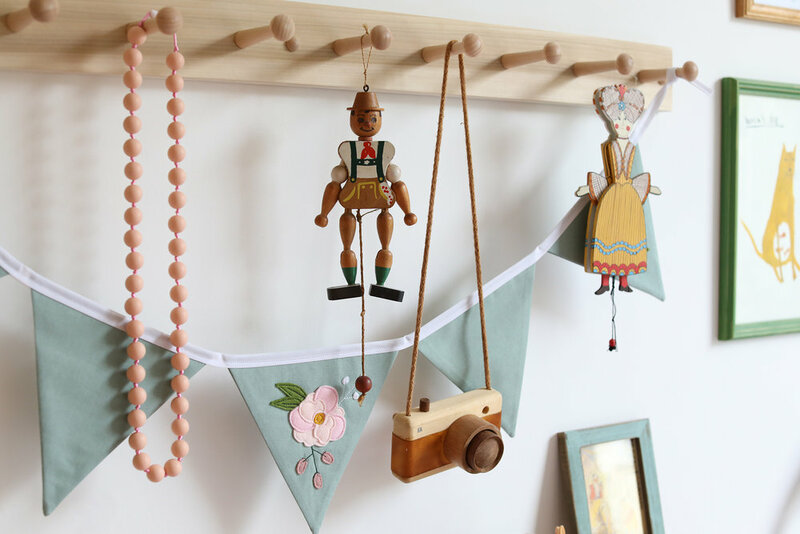 Handmade bunting from Alba Makes Embroidery, Jewellery from Halia Rose, Wooden camera from Fanny and Alexander. Little wooden drawstring puppets I found in Hastings Old Town in one of the many antique shops. 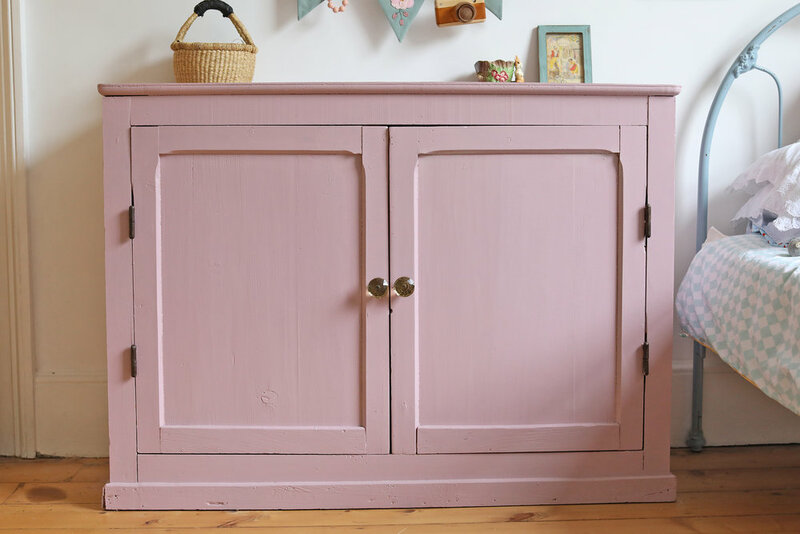 Pink cupboard painted in Farrow & Ball ‘Cinder Rose’ high gloss. I love painting with water-based paint. It makes life a lot easier! 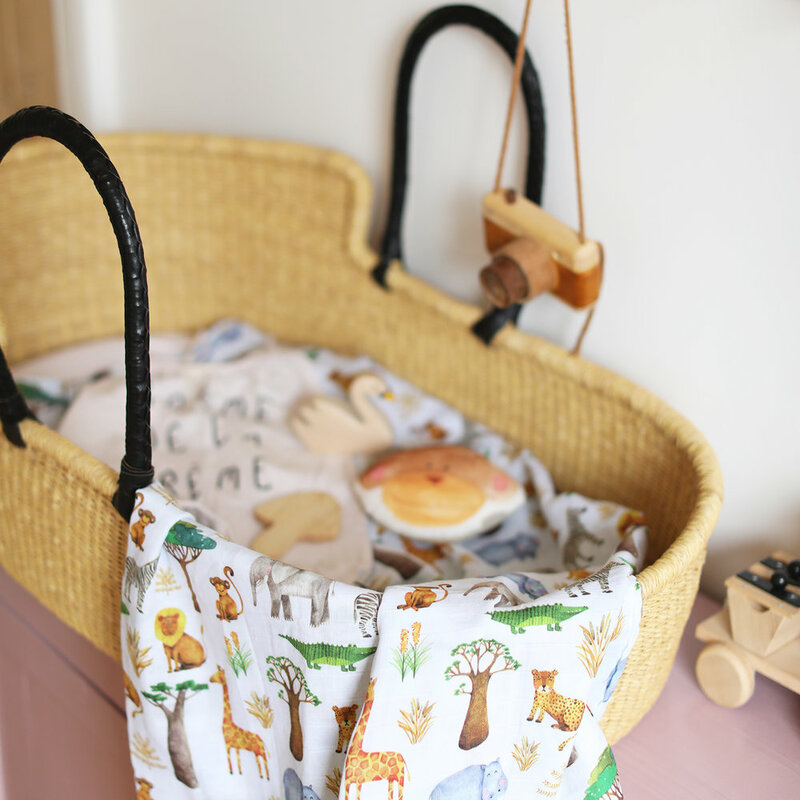 Cute basket from Tilly and Cub. The beautiful raindrop garland is from the very talented Velveteen Babies. I’m not entirely sure that this is the right place for the garland, but i’m leaving it here for now. I will find the perfect spot eventually! The cute wooden dog was a gift from my friend Rebecca. It is from Sarah & Bendrix. Cute little romper from Emma Neale Handmade. 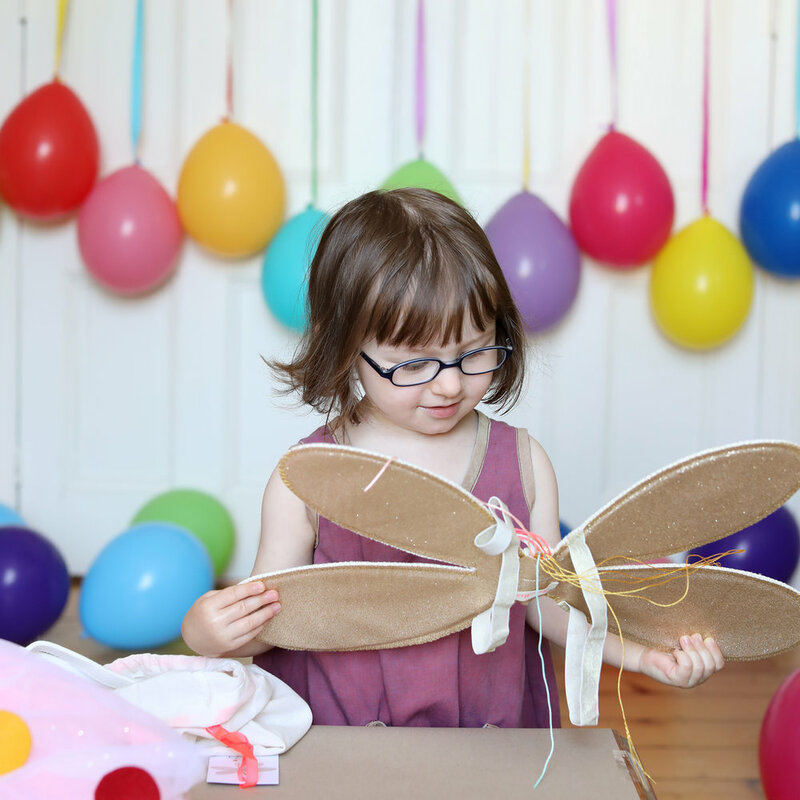 The butterfly wings were for Penelope’s third birthday. She was dressed as a butterfly. I did a little blog post about the party here. This cute little doll family is from The Citizens Collectible. They were a gift from my best friends, Angela and Bree. We still need to get a little Beatrix. The ‘Alice in Wonderland’ wallpaper is designed by Charles Voysey. You can purchase his designs from Trustwort Wallpaper. The patterns are produced both by the hand silk screening process and new digital technology. Most patterns are produced in true document scale and color. It wasn’t cheap, but definitely worth it. It was a very stressful day for my mum and aunt Jackie when they put it up! Wojtek, my husband, loves books. So when Penelope came along he had another person to buy books for, which made him very happy. I now I don’t have any space to put them! The letter print is from the lovely Lucy Says I Do. The ‘B” is for Beatrix. Animal alphabet print from Rifle Paper Co.
Dinosaur toys from Georgina Giles. The beautiful blue vintage bed is from my friend, Bree. Please watch the video below for a little tour of the nursery! Music ‘The Sweetest Thing’ by Stephan Kreussel.